Imagine my surprise when I first saw an Israeli bite into a juicy tomato as if it were an apple. While it was a shock, it is actually quite common here in the Levant to do so—with a tomato or a cucumber—as an accompaniment to a sandwich, much like an American might eat a bag of chips. Incidentally, these two extremely popular yet fundamentally basic vegetables make up the main elements of the famed Israeli salad—a chopped veggie dish of cubed cucumbers, tomatoes (and sometimes pepper, finely chopped onion and other tweaks) with a light dressing of lemon juice and olive oil. While the obsession with having fresh vegetables at every meal seems uniquely Israeli to many Diaspora Jews, it is the culinary reality for most cultures who call the Levant home. Since the days of the first European pioneers who immigrated to pre-state Israel in the late 19th and early 20th centuries, Jewish food in Israel has evolved based on what was available or convenient to produce, rather than the heavy, rich European food that the settlers left behind in the cold weather of their native lands. Israelis derived inspiration from the land itself as well as from what they saw the locals eating. Israel’s neighbors—Syria, Lebanon and Jordan, for example—have their own version of the chopped vegetable salad, with understandably different names such as Arabic salad, Lebanese salad or Jordanian salad. And each culture adds their own accent to the ubiquitous side. Many variations are called fattoush, a term referring to the use of stale bread—usually pita (aka Syrian bread! )—repurposed as croutons and used as the main element of the salad. While a fresh chopped salad comprising coarsely cut cucumbers, tomatoes, red onion, peppers and parsley is one of my family’s standard go-to’s for a quick side dish, it is often more of an afterthought than a well composed salad. Instead, if I have a moment and really want to pamper my sons, I recreate a favorite salad I first tasted in an Arab village in the upper Galilee, which was served to me after picking olives with friends in their family’s orchard. 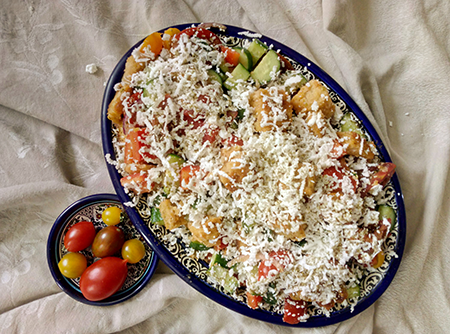 This salad begins with the usual suspects: chopped tomatoes and cucumbers topped with crumbled full-fat feta cheese, a hearty sprinkling of za’atar and dotted with chunks of day-old bread that has been toasted in olive oil. To make it my own, I like to use Israeli cherry tomatoes, which are grown in the Arava Valley and come in a variety of bright yellows, reds and even pink and green striped, and need only be quartered before tossing them into a salad bowl. I also like to add thinly sliced red onions, which can jazz up nearly any salad, and red bell peppers, which lend sweetness and crunch. Since I more often have leftover challah on hand than day-old pita, this is what I like to use for the fattoush element. After removing the crust, I toast the challah in the oven with olive oil, salt, garlic and za’atar. It’s the Jewish-Israeli, garlic-and-herb challah croutons that transform this traditionally Arab salad into a representation of the mix of cultures that make up the Levant. 1. Heat oven to 350 degrees. Remove crust from the challah slices and cut into large cubes. 2. Place challah cubes on a baking tray lined with aluminum foil. Toss the cubes with olive oil as well as garlic, za’atar and salt to taste, then bake for 10-12 minutes, or until golden brown and crisp to the touch, but not crunchy all the way through. Set aside to cool while you prepare the rest of the salad. 3. Chop the cucumbers and red pepper, quarter the cherry tomatoes and finely slice the red onion. Place all the vegetables together in a serving bowl and toss with olive oil, lemon juice, salt and pepper to taste. 4. 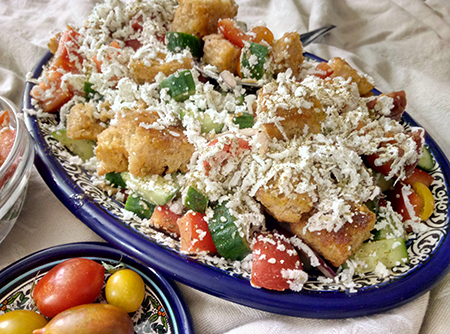 Just before eating, add the croutons to the salad and toss, then top with crumbled Feta cheese and a good sprinkle of za’atar. Note: If preparing in advance, chop the vegetables but don’t dress with oil, lemon juice and spices until just before serving. In this case, also keep the croutons prepped but separate, until serving time.